There are few neighborhoods in our region that have as good transit service as the International Blvd area of Tukwila does. With that comes an opportunity to harness existing capacity and use it to stimulate development. 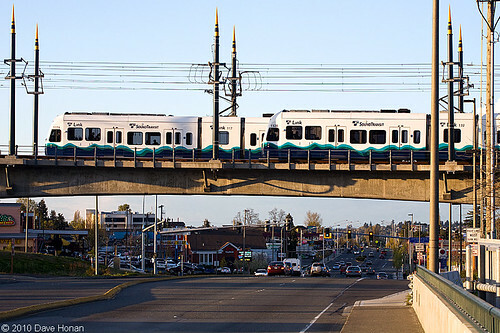 Yet Tukwila is often overlooked when it comes to TOD and land use. Indeed, the town is largely suburban and low-density; however, it also has one of the State’s highest minority populations and is, geographically, situated at an important “crossroads” in South King. A Line: Federal Way and points south along Pacific Highway. Link: Sea-Tac Airport, Rainier Valley, Downtown Seattle, and connections north. 124: Alternative all-day service to Seattle via the Duwamish through Georgetown & SODO. 140: Burien to the west, Southcenter, Renton to the east, to be replaced by the F Line in the future. While addressing the latter two requires making costly infrastructure improvements, relaxing the land use code itself would induce greater demand for density and pressure to make those kind of investments. By legally maximizing the development potential around the station, Tukwila has the special opportunity to harness TOD growth in building a dense mixed-use corridor along International Boulevard, a nice complement to SeaTac’s station area plan if and when it comes back online in the future. *For comparison, lowrise multifamily residential zones in Seattle require between 1,200 and 1,600 sq. feet of lot area per unit. An idea what happened or is planned for the canceled Link stop near Boeing Access Road. I live very close and we were shocked to find out it wasn’t getting built, there was no outreach or chance to fight for it. Would really love to hear an update. I’ve written Sound Transit many times about this, and have never gotten a response. I am quite dissapointed that there has been no communication about this stop. I work a short bike ride away from where this station would have been built, and would use it daily if it existed. Sadly, I am stuck on the 124 until if and when it is built. Considering how many people work in the area (Group Health, Boeing, Intergate East, etc) I am very surprised that this obvious station location has been ignored. Our household would definitely be vocal and in attendance if ever becomes possible. We work at UW and live in Allentown, that stop was crucial in our decision to live in the neighborhood. We are newly appreciate of the “south seattle gets screwed” meme — it’s accurate. We would it use daily also, probably even more often than that as we love to visit Columbia City on weekends and evenings. It was cut due to lack of funding. Any idea if there are any intentions to build it down the road? or is it gone for ever? The ridership estimates are poor, and the potential for redevelopment is severely curtailed by the runway. It was cut in the post-Sound Move crisis and didn’t reappear in ST2. More practically, that would be a South King Station, and given all the Federal Way business there’s no way they’re looking to add another project in that subarea. If you’re fired up about BAR, your first step would be to get either Julia Patterson or the Mayor of Tukwila excited about it. Yeah South Seattle, really the only part of the city currently serviced by light rail, really got screwed here. Give me a break. BAR is north Tukwila, not south Seattle. Boeing Access was deferred as was a stop at Graham in the Rainier Valley. They were constructed so a stop could be added later, but that is highly unlikely given ST’s financial situation, especially in South King which was the most impacted subarea by the recession. The walkshed of the station is largely consumed by its own parking lot, and then the walking distance to the nearest front door, facing away from the station, into the parking lot of the motel-style fenced-in apartment complexes along Southcenter Way. If the station and these apartments concurred on a plan for a pedestrian path from the southeast corner of the station to the southwest corner of the first apartment complex, and then from the southeast corner of that complex into the southwest corner of the next complex, that would at least get some residents into the walkshed. Of course, some people living there might fear the idea of bus riders walking through their neighborhood. There are lots of reasonably affordable apartments in the triangle between Foster High, 144th & Military Rd S, and TIBS, but I don’t think any get above two stories. The most immediate redevelopment potential is the parking lot itself (into something other than a parking garage, please) and the suburban car-oriented businesses just to the north. Indeed, the whole strip on International Boulevard up to 144th is ripe for TOD, if the zoning will just allow it. There are no adjacent single-family neighborhoods to worry about until north of there. Redevelopment could also spread westward *if* the F Line were to approach TIBS from the northwest. The 128 still gets good ridership heading northwest into Boulevard Park then eventually White Center and West Seattle, and northeast to Foster High. It goes several blocks beyond the 144th-Military-42nd non-SFH district before running out of apartments. So, there really shouldn’t be a heavy anti- lobby to TOD in the several blocks closest to the station. Even to the southside, there are lots of two-story apartment complexes before any SFHs appear, but the pedestrian access over the freeway needs (and is getting) some work. The access to that pedestrian path is a tall stairway from the bus transfer portion of the station. An elevator there sure would be nice. As an alternative to the F Line approaching TIBS from the northwest, the 128 and or 132 paths could be adjusted to support TOD in that sector. I’m presuming that Metro will, some day, stop spending the extra money to have the 132 go out of its way to Burien, just to serve a drug clinic, a few parks, an old bar, and a dozen houses on one side of a street. The 132 will cease serving south of Burien TC/P&R after the restructure, barring some unforeseen change, so that’s a start. Tukwilla was really messed up by not having LINK go to the South Center area. That’s where the city zoned for retail and business. And yes it would have added another minute or two to the ride, but it would have serviced the part of the town that they zoned for the growth. My theory is why it wasn’t done is also that Tukwilla being outside of Seattle would have collected sales tax from South Seattle Residents going South to shop vs going North into the city. My circumstantial evidence is that routing past Northgate was never even an option on the table. And yes I know all about the “funding” argument. Originally the proposal was for Link to go up Tukwila International Boulevard at grade similar to the Valley. Tukwila fought this tooth and nail and caused ST to spend time and money on the alignment. Tukwila’s staff was consistently hostile to ST. The current alignment was a compromise worked out with Tukwila. The Southcenter route was too expensive for South King at the time and would have required additional revenue. It had nothing to do with where South Seattle folks would shop. I’ve never understood the reasoning to route through Northgate. First, look at this schedule. Then consider that Metro is adding service to the 41 in June to relieve overcrowding. Repeat until you achieve enlightenment. Northgate has been the transit hub of North Seattle for decades. It’s both a major destination and a central location, the two most important features of a hub. That’s why the transit center was built there (although freeway access was also a factor), and since then routes have been gradually truncated at Northgate. (307 split to 41 and 522; 305 split as 66 and 348; 316 truncated as 346; 377 truncated as 347; I don’t know where the 345 came from.) I think the 316 and 377 were previously shuttles off-peak, but that again shows Northgate’s longstanding status as the transit hub. The 345 is the old 302 which makes me think that the 348 wasn’t the old 305. The 302 and 305 were a pair that ran from the Ferry Terminal to Shoreline CC and only deviating at Northgate. The 305 ran along 5th Ave up to 145th, over to Greenwood, and then up to the college. Matt: That schedule — or more usefully, this frequency table — shows a route which runs every 15 minutes for most of the day, except for a deluge of one-way peak-only turnback runs. In contrast, the U-District and Capitol Hill have (and desperately need) 10-minute service all day long. So does South Seattle (in the form of the 7). And incidentally, so does Ballard, in the form of the 15/18. The combined ridership of the 15/18 is about on par with the 41, if not higher. If you skip the one-way peak, I have no doubt that demand to Ballard is much stronger. So I’m with Geoff. There’s just no way you can say that Northgate is the highest-priority destination after the U-District. As has been discussed ad nauseum, you can’t build another line into the DSTT from the north without building a level junction, which ST won’t contemplate and would constrain the capacity of all the lines involved. If you’re going to build one line, and it’s going to a regional line (which is what ST has an electoral mandate to build, even if it’s not the best for Seattle), the northern one should hit Northgate. I seem to recall the 345’s Four Freedoms deviation from the forerunner to the 66. We need to stop playing the “Does this area have enough non-peak riders for frequent service?” game. If you don’t build the transit, it can’t grow into a more transit-using area. Seattle has too many places where somebody thought “Greenwood is below the threshold for 15-minute evening service”. Upgrading the quality of transit upgrades the quality of the city, even if the buses/trains aren’t always full. I assumed the question was, is Northgate the best place for a north-south route. If the question is really, is Northgate less deserving than Ballard?, then I have to say the time for arguing that was when ST2 was designed, not when they’re at 90% station engineering. Angry Transit Nerd, you didn’t really provide an answer, but your condescension is appreciated anyways. The author unfortunately neglected the rest of the potential TOD area around TIBS — across International Blvd to the west. That’s in the City of Sea-Tac, and they have a much different attitude and plans than City of Tukwila. Suggest a followup piece to fill out this discussion. Even if zoning were in place, the rents wouldn’t justify redevelopment to stacked product, but perhaps some larger affordable projects could be built there. 1) Call your county council member right now and remind them to vote for the June 2012 transit reinvestments. The 41 is in the queue to get relief service. 2) It’s hard to tell who is getting left at Westlake Station. While some are waiting for an open standing space on the 41, some are waiting for the next 71-74, some are waiting for the 301, and some are waiting for the 316. One thing you have to understand is that “auto oriented development” is another word for incredibly diverse small businesses. Unless you’re the guy with a dry cleaners, Pho noodle house or nail salon in 1203 3rd Avenue, you’re not going to have direct transit access from your low cost 3-bedroom home on Kent East to your shop. And that cuts to the problem of mass transit as conceived by the Social Engineers of STB…taking people from dense residences to dense office buildings. The wonder of South Seattle, South King, which some call ugly, but which I see a beautiful model of free, yet low income, enterprise, is that it can support so many classes of workers and business people with shops everywhere. Nonsense, the dozens and dozens of small shops on the main streets of Ballard, Lake City, Wallingford, Capitol Hill, Columbia City, West Seattle, et cetera are just as diverse as a strip mall in suburbia (or more). Of those, I would say that Lake City, Columbia City, West Seattle are more along the lines of South King/Seattle. Lots of little strip mall styles with a few parking spaces…kind of like Georgetown even. Auto Oriented Development (AOD) has probably led to many of the most profound and innovative businesses because you can locate in a very cheap area and yet draw customers individually from far away at all hours of the day and night. Speaking of cheap, the South King sub area has an $800 million sales tax shortfall for Sound Transit. Seattle has fared much better. That tells me business isn’t doing well down there. It could be doing well, but just not at the inflated overpriced levels of urbists. As I said, these sparse areas generate a lot of low income, but viable jobs for a lot of people as opposed to the high wage, high dense lifestyle. Maybe a “low cost three bedroom home in Kent East” is too expensive for the planet. When Iran gets that big firecracker and tosses one on Ras Tanura I feel for you folks in the boon-docks. You’ll be getting up at 5:00 AM to walk to downtown Kent, getting on a train of converted boxcars to haul into the city and then squeezing onto a electric bus to get you to your destination. That is, if you have a job. Try growing food on Westlake Plaza. It’s cheap because the buildings are old and ugly. It wasn’t cheap when they were new. So we can have old space-wasting junk buildings, or old compact buildings like on Rainier Avenue south of Columbia City. The compact buildings come right up to the sidewalk and are human-scaled: they have the potential to generate a community. Old strip malls are just drive-by buildings and always will be. So if we want more cheap, old compact buildings in the future, we need to build more new compact buildings now. Especially since we’ve been overbuilding the sprawling kind, and went into overdrive in the 1990s with big-box stores.